I have to brag a little. THere was no work for me on Wednesday, so I joined up with my happily unemployed buddy Andrew and we headed offshore about 30 miles out to dive on the kelp paddies. It was absolutely beautiful. Clear, warm, blue water (70 degrees) and the weather was warm and mostly sunny without much wind. On the first paddy we found, I politely offered to let Andrew jump in on it first, as he was skipper. He said he was a bit cold and told me to jump in. Okay! As I was suiting up, we could see some Mahi Mahi swimming around. I was stoked. I jumped in and it was like a movie. Bait everywhere under the kelp paddy and a big school of small mahi mahi and a school of yellowtail were swimming around attacking the bait fish. I was really wanting a mahi mahi, as I've never taken one, but a good sized yellowtail gave up a good shot, so I fired and watched my shaft go below the fish and then it kept going, going, gone! Crap! In our haste, Andrew hooked my float line to my gun handle, rather than to my shooting line. I failed to double check it. Therefore, by shaft had nothing attached for retrieving it! Brand new, never been used. Oh well. I went to the boat and grabbed another shaft. I loaded it up and the fish came back around. I was lining up on a smallish mahi mahi when a school of good sized YT swim by, but at higher speed. 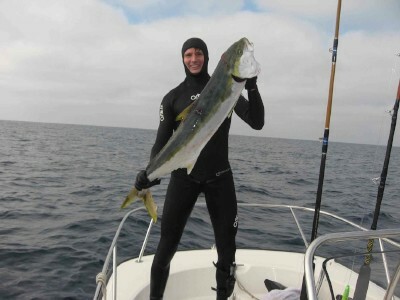 Mahi Mahi were being caught everywhere per radio report, so I decided to line up on the larger yellowtail school. They were really moving and I was kicking really hard and my gun was really pressured from the water resistance, but I lined up and WHACK! I let it run because out there, it has nowhere to go. We were in 226 fathoms of water, so no worries about tangling up deep on something. I had it on a bungee line, so it doesn't pressure the fish or me too much. I was stoked and realized it was a decent fish, but not until I started getting it close to me did I realize that it was a PIG! It got hot when I tried to handle it, so I let it run again two more times. It looked tired, so I took it by the tail, wrapped my legs around it and then grasped it in the gills. It just layed there while I brained it. I still didn't fully realize the size until I boated it and it wouldn't fit in the big fish cooler. Turns out she was female with about 1.5 pounds of roe. The rest of the day was great too. 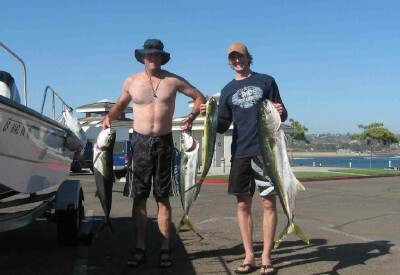 We each got another YT and I got a mahi mahi (my first!). So, it was an exceptional day. We also saw several sunfish, tons of dolphins and played with them, a marlin, schools of tuna (couldn't hook em), and a whale. The YT weighed in at 37 pounds bled and gutted, so it was probably 43 pounds or so given the roe.